Area Ranked 38th in the U.S.
Population Ranked 16th in the U.S.
Ranked 16th in the U.S.
Song(s) official "On the Banks of the Wabash, Far Away" unofficial "Back Home Again in Indiana"
Indiana /ɪndiˈænə/ is a U.S. state located in the midwestern and Great Lakes regions of North America. Indiana is the 38th largest by area and the 16th most populous of the 50 United States. Its capital and largest city is Indianapolis. Indiana was admitted to the United States as the 19th U.S. state on December 11, 1816. Indiana has a diverse economy with a gross state product of $298 billion in 2012. Indiana has several metropolitan areas with populations greater than 100,000 and a number of smaller industrial cities and towns. Indiana is home to several major sports teams and athletic events including the NFL's Indianapolis Colts, the NBA's Indiana Pacers, the WNBA's Indiana Fever, the Indianapolis 500, and Brickyard 400 motorsports races. The first inhabitants in what is now Indiana were the Paleo-Indians, who arrived about 8000 BC after the melting of the glaciers at the end of the Ice Age. Divided into small groups, the Paleo-Indians were nomads who hunted large game such as mastodons. They created stone tools made out of chert by chipping, knapping and flaking. The Archaic period, which began between 5000 and 4000 BC, covered the next phase of indigenous culture. The people developed new tools as well as techniques to cook food, an important step in civilization. Such new tools included different types of spear points and knives, with various forms of notches. They made ground-stone tools such as stone axes, woodworking tools and grinding stones. During the latter part of the period, they built earthwork mounds and middens, which showed that settlements were becoming more permanent. The Archaic period ended at about 1500 BC, although some Archaic people lived until 700 BC. Afterward, the Woodland period took place in Indiana, where various new cultural attributes appeared. During this period, the people created ceramics and pottery, and extended their cultivation of plants. An early Woodland period group named the Adena people had elegant burial rituals, featuring log tombs beneath earth mounds. In the middle portion of the Woodland period, the Hopewell people began developing long-range trade of goods. Nearing the end of the stage, the people developed highly productive cultivation and adaptation of agriculture, growing such crops as corn and squash. The Woodland period ended around 1000 AD. The Mississippian culture emerged, lasting from 1000 until the 15th century, shortly before the arrival of Europeans. During this stage, the people created large urban settlements designed according to their cosmology, with large mounds and plazas defining ceremonial and public spaces. The concentrated settlements depended on the agricultural surpluses. One such complex was the Angel Mounds. They had large public areas such as plazas and platform mounds, where leaders lived or conducted rituals. Mississippian civilization collapsed in Indiana during the mid-15th century for reasons that remain unclear. The historic Native American tribes in the area at the time of European encounter spoke different languages of the Algonquian family. They included the Shawnee, Miami, and Illini. Later they were joined by refugee tribes from eastern regions including the Delaware who settled in the White and Whitewater River Valleys. 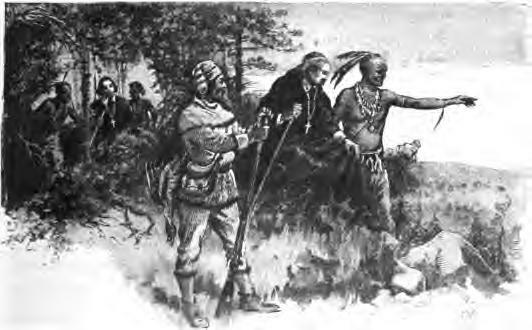 Native Americans guide French explorers through Indiana, as depicted by Maurice Thompson in Stories of Indiana. The tribes in Indiana did not give up; they destroyed Fort Ouiatenon and Fort Miami during Pontiac's Rebellion. The British royal proclamation of 1763 designated the land west of the Appalachians for Indian use, and excluded British colonists from the area, which the Crown called Indian Territory. In 1775, the American Revolutionary War began as the colonists sought more self-government and independence from the British. The majority of the fighting took place near the East Coast, but the Patriot military officer George Rogers Clark called for an army to help fight the British in the west. Clark's army won significant battles and took over Vincennes and Fort Sackville on February 25, 1779. During the war, Clark managed to cut off British troops, who were attacking the eastern colonists from the west. His success is often credited for changing the course of the American Revolutionary War. At the end of the war, through the Treaty of Paris, the British crown ceded their claims to the land south of the Great Lakes to the newly formed United States, including American Indian lands. In 1787, the US defined present-day Indiana as part of its Northwest Territory. In 1800, Congress separated Ohio from the Northwest Territory, designating the rest of the land as the Indiana Territory. President Thomas Jefferson chose William Henry Harrison as the governor of the territory and Vincennes was established as the capital. After Michigan Territory was separated and the Illinois Territory was formed, Indiana was reduced to its current size and geography. Map showing extent of the treaty lands. In order to decrease the threat of Indian raids following the Battle of Tippecanoe, Corydon, a town in the far southern part of Indiana, was named the second capital of the Indiana Territory in May 1813. Two years later, a petition for statehood was approved by the territorial general assembly and sent to Congress. An Enabling Act was passed to provide an election of delegates to write a constitution for Indiana. On June 10, 1816, delegates assembled at Corydon to write the constitution, which was completed in 19 days. President James Madison approved Indiana's admission into the union as the nineteenth state on December 11, 1816. In 1825, the state capital was moved from Corydon to Indianapolis. Many European immigrants went west to settle in Indiana in the early 19th century. The largest immigrant group to settle in Indiana were Germans, as well as numerous immigrants from Ireland and England. Americans who were primarily ethnically English migrated from the Northern Tier of New York and New England, as well as the mid-Atlantic state of Pennsylvania. The arrival of steamboats on the Ohio River in 1811, and the National Road at Richmond in 1829 greatly facilitated settlement of northern and western Indiana. Following statehood, the new government worked to transform Indiana from a frontier into a developed, well-populated, and thriving state, beginning significant demographic and economic changes. The state's founders initiated a program, Indiana Mammoth Internal Improvement Act, that led to the construction of roads, canals, railroads and state-funded public schools. The plans bankrupted the state and were a financial disaster, but increased land and produce value more than fourfold. In response to the crisis and in order to avert another, in 1851, a second constitution was adopted. Among its provisions were a prohibition on public debt and extension of suffrage to African-Americans. During the American Civil War, Indiana became politically influential and played an important role in the affairs of the nation. As the first western state to mobilize for the United States in the war, Indiana had soldiers participating in all of the major engagements. The state provided 126 infantry regiments, 26 batteries of artillery and 13 regiments of cavalry to the cause of the Union. In 1861, Indiana was assigned a quota of 7,500 men to join the Union Army. So many volunteered in the first call that thousands had to be turned away. Before the war ended, Indiana contributed 208,367 men to fight and serve in the war. Casualties were over 35% among these men: 24,416 lost their lives in the conflict and over 50,000 more were wounded. The only Civil War battle fought in Indiana was the Battle of Corydon, which occurred during Morgan's Raid. The battle left 15 dead, 40 wounded, and 355 captured. Template:Missing information Indiana remained a largely agricultural state; post-war industries included food processing, such as milling grain, distilling it into alcohol, and meatpacking; building of wagons, buggies, farm machinery, and hardware. With the conclusion of World War II, Indiana rebounded to levels of production before the Great Depression. Industry became the primary employer, a trend that continued into the 1960s. Urbanization during the 1950s and 1960s led to substantial growth in the state's cities. The auto, steel and pharmaceutical industries topped Indiana's major businesses. Indiana's population continued to grow during the years after the war, exceeding five million by the 1970 census. In the 1960s, the administration of Matthew E. Welsh adopted its first sales tax of two percent. Indiana schools were desegregated in 1949. In 1950, the Census Bureau reported Indiana's population as 95.5% white and 4.4% black. Governor Welsh also worked with the General Assembly to pass the Indiana Civil Rights Bill, granting equal protection to minorities in seeking employment. Square quarter sections of farmland cover central Indiana. Rolling hills in Brown County State Park, emblematic of the southern Indiana landscape. Indiana Dunes National Lakeshore in northwest Indiana. The Wabash River near Williamsport. The average altitude of Indiana is about 760 feet (230 m) above sea level. The highest point in the state is Hoosier Hill in Wayne County at 1,257 feet (383 m) above sea level. The lowest point at 320 feet (98 m) above sea level is located in Posey County, where the Wabash River flows into the Ohio River. Only 2,850 square miles (7,400 km2) have an altitude greater than 1,000 feet (300 m) and this area is enclosed within 14 counties. About 4,700 square miles (12,000 km2) have an elevation of less than 500 feet (150 m), mostly concentrated along the Ohio and lower Wabash Valleys, concentrated from Tell City and Terre Haute to Evansville and Mount Vernon. The state includes two natural regions of the United States, the Central Lowlands and the Interior Low Plateaus. The till plains make up the northern and central allotment of Indiana. Much of its appearance is a result of elements left behind by glaciers. Central Indiana is mainly flat with some low rolling hills (except where rivers cut deep valleys through the plain, like at the Wabash River and Sugar Creek) and soil composed of glacial sands, gravel and clay, which results in exceptional farmland. Northern Indiana is also very similar except for the presence of higher and hillier terminal moraines and many kettle lakes in some regions. In northwest Indiana, there are various sand ridges and dunes, some reaching near 200 feet in height. These are located along the Lake Michigan shoreline and also inland to the Kankakee River Valley. The unglaciated southern segment of the state carries a different and off-balance surface, characterized in places by profound valleys and rugged, hilly terrain much different from the rest of the state. Here, bedrock is exposed at the surface and isn't buried in glacial till like further north. Because of the prevalent limestone, there are numerous caves in the area. The soil is fertile in the valleys of southern Indiana. Major river systems in Indiana include the Whitewater, White, Blue, Wabash, St. Joseph, and Maumee rivers. According to the Indiana Department of Natural Resources, in 2007 there were 65 rivers, streams, and creeks of environmental interest or scenic beauty, which included only a portion of an estimated 24,000 total river miles within the state. The Ohio River forms Indiana's southern border with Kentucky. The major cities of New Albany and Evansville are located on the river. Indiana map of Köppen climate classification. Autumn in West Point (2010). A barn after a winter snow in Clinton County (2010). Map of U.S. time zones with new (2006) CST and EST areas displayed, showing Indiana largely in EST. Indiana is one of thirteen U.S. states that are divided into more than one time zone. Indiana's time zones have fluctuated over the past century. At present most of the state observes Eastern Time; six counties near Chicago and six near Evansville observe Central Time. Debate continues on the matter. Indianapolis is the capital of Indiana and its largest city. Indiana's four largest metropolitan areas are Indianapolis, Fort Wayne, Evansville, and South Bend. The table below lists the ten largest municipalities in the state based on the 2014 United States Census Estimate. Age and gender distribution in Indiana. The United States Census Bureau estimates that the population of Indiana was 6,619,680 on July 1, 2015, a 2.10% increase since the 2010 United States Census. 0.1% Native Hawaiian and other Pacific Islanders. Hispanic or Latino of any race made up 6.2% of the population. The Hispanic population is Indiana's fastest-growing ethnic minority. 28.2% of Indiana's children under the age of 1 belonged to minority groups (note: children born to white hispanics are counted as minority group). Population growth since 1990 has been concentrated in the counties surrounding Indianapolis, with four of the top five fastest-growing counties in that area: Hamilton, Hendricks, Johnson, and Hancock. The other county is Dearborn County, which is near Cincinnati, Ohio. Hamilton County has also been the fastest-growing county in the area consisting of Indiana and its bordering states of Illinois, Michigan, Ohio and Kentucky, and is the 20th fastest-growing county in the country. Indianapolis is the state capital and largest city in Indiana. 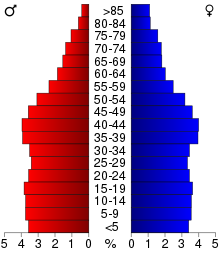 With a population of 829,817, Indianapolis is the largest city in Indiana and 12th largest in the United States, according to the 2010 Census. Three other cities in Indiana have a population greater than 100,000: Fort Wayne (253,617), Evansville (117,429) and South Bend (101,168). Since 2000, Fishers has seen the largest population rise amongst the state's 20 largest cities with an increase of 100 percent. Indiana is home to the St. Meinrad Archabbey, one of two Catholic archabbeys in the United States and one of 11 in the world. The Lutheran Church–Missouri Synod has one of its two seminaries in Fort Wayne. Two conservative denominations, the Free Methodist Church and the Wesleyan Church, have their headquarters in Indianapolis as does the Christian Church. The Friends United Meeting of the Religious Society of Friends, the largest branch of American Quakerism, is based in Richmond, which also houses the oldest Quaker seminary in the United States, the Earlham School of Religion. The Islamic Society of North America is headquartered in Plainfield. The 50th and incumbent Governor of Indiana, Mike Pence. The Indiana State House in Indianapolis has been the seat of state government since 1888. From 1880 to 1924, a resident of Indiana was included in all but one presidential election. Indiana Representative William Hayden English was nominated for Vice-President and ran with Winfield Scott Hancock in the 1880 election. In 1884, former Indiana Governor Thomas A. Hendricks was elected Vice-President of the United States. He served until his death on November 25, 1885, under President Grover Cleveland. In 1888, Indiana Senator Benjamin Harrison was elected President of the United States and served one term. He remains the only U.S. President from Indiana. Indiana Senator Charles W. Fairbanks was elected Vice-President in 1904, serving under President Theodore Roosevelt until 1909. Fairbanks made another run for Vice-President with Charles Evans Hughes in 1916, but they both lost to Woodrow Wilson and Indiana Governor Thomas R. Marshall, who served as Vice-President from 1913 until 1921. Not until 1988 did another presidential election involved a native of Indiana, when Senator Dan Quayle was elected Vice-President and served one term with George H. W. Bush. Harvesting on a farm in Stewart, Indiana. A windfarm generates electricity in Benton County. The state has an estimated coal reserves of fifty-seven billion tons; state mining operations produces thirty-five million tons of coal annually. Indiana also possesses at least 900 million barrels of petroleum reserves in the Trenton Field, though not easily recoverable. While Indiana has made commitments to increasing use of renewable resources such as wind, hydroelectric, biomass, or solar power, however, progress has been very slow, mainly because of the continued abundance of coal in Southern Indiana. Most of the new plants in the state have been coal gasification plants. Another source is hydroelectric power. Indianapolis International Airport serves the greater Indianapolis area and has finished constructing a new passenger terminal. The new airport opened in November 2008 and offers a new midfield passenger terminal, concourses, air traffic control tower, parking garage, and airfield and apron improvements. Other major airports include Evansville Regional Airport, Fort Wayne International Airport (which houses the 122d Fighter Wing of the Air National Guard), and South Bend International Airport. A long-standing proposal to turn Gary Chicago International Airport into Chicago's third major airport received a boost in early 2006 with the approval of $48 million in federal funding over the next ten years. The Terre Haute International Airport has no airlines operating out of the facility but is used for private flying. Since 1954, the 181st Fighter Wing of the Indiana Air National Guard has been stationed at the airport. However, the Base Realignment and Closure (BRAC) Proposal of 2005 stated that the 181st would lose its fighter mission and F-16 aircraft, leaving the Terre Haute facility as a general-aviation only facility. The southern part of the state is also served by the Louisville International Airport across the Ohio River in Louisville, Kentucky. The southeastern part of the state is served by the Cincinnati/Northern Kentucky International Airport also across the Ohio River in Hebron, Kentucky. Most residents of Northwest Indiana, which is primarily in the Chicago Metropolitan Area, use the two Chicago airports, O'Hare International Airport and Chicago Midway International Airport. US Route 52 in Lafayette (2006). The major U.S. Interstate highways in Indiana are Interstate 64 (I-64), I-65, I-265, I-465, I-865, I-69, I-469, I-70, I-74, I-80, I-90, I-94, and I-275. The various highways intersecting in and around Indianapolis, along with its historical status as a major railroad hub, and the canals that once crossed Indiana, are the source of the state's motto, the Crossroads of America. There are also many U.S. routes and state highways maintained by the Indiana Department of Transportation. These are numbered according to the same convention as U.S. Highways. Indiana allows highways of different classifications to have the same number. For example, I-64 and Indiana State Road 64 both exist (rather close to each other) in Indiana, but are two distinct roads with no relation to one another. Most Indiana counties use a grid-based system to identify county roads; this system replaced the older arbitrary system of road numbers and names, and (among other things) makes it much easier to identify the sources of calls placed to the 9-1-1 system. Such systems are easier to implement in the glacially flattened northern and central portions of the state. Rural counties in the southern third of the state are less likely to have grids and more likely to rely on unsystematic road names (e.g., Crawford, Harrison, Perry, Scott, and Washington Counties). There are also counties in the northern portions of the state that have never implemented a grid, or have only partially implemented one. Some counties are also laid out in an almost diamond-like grid system (e.g. Clark, Floyd, Gibson, and Knox Counties). Such a system is also almost useless in those situations as well. Knox County once operated two different grid systems for county roads because the county was laid out using two different survey grids, but has since decided to use road names and combine roads instead. Notably, the county road grid system of St. Joseph County, whose major city is South Bend, uses perennial (tree) names (i.e. Ash, Hickory, Ironwood, etc.) in alphabetical order for North-South roads and Presidential and other noteworthy names (i.e. Adams, Edison, Lincoln Way, etc.) in alphabetical order for East-West roads. There are exceptions to this rule in downtown South Bend and Mishawaka. Hamilton county just continues the numbered street system from Downtown Indianapolis from 96th Street at the Marion County line to 296th street at the Tipton County line. A South Shore commuter train in Michigan City. Indiana has over 4,255 railroad route miles, of which 91 percent are operated by Class I railroads, principally CSX Transportation and the Norfolk Southern Railway. Other Class I railroads in Indiana include the Canadian National Railway and Soo Line Railroad, a Canadian Pacific Railway subsidiary, as well as Amtrak. The remaining miles are operated by 37 regional, local, and switching and terminal railroads. 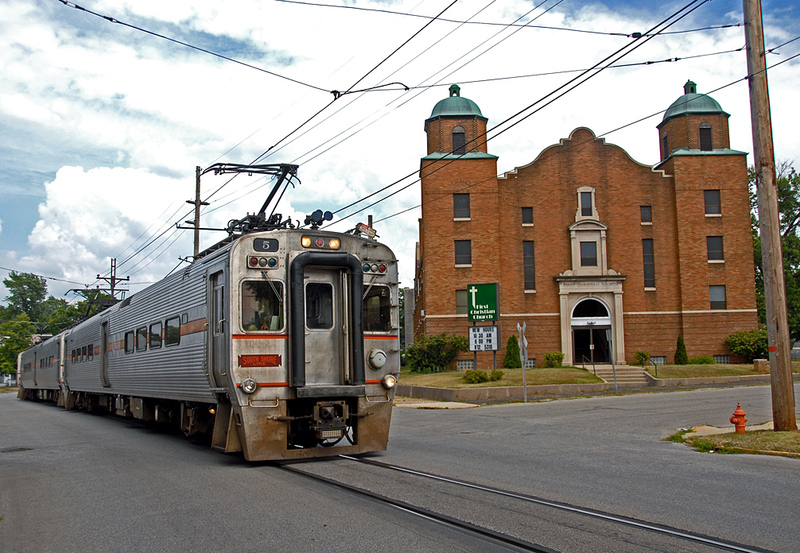 The South Shore Line is one of the country's most notable commuter rail systems, extending from Chicago to South Bend. Indiana is currently implementing an extensive rail plan that was prepared in 2002 by the Parsons Corporation. Many recreational trails, such as the Monon Trail and Cardinal Greenway, have been created from abandoned rails routes. Port of Indiana–Burns Harbor on Lake Michigan. Indiana annually ships over 70 million tons of cargo by water each year, which ranks 14th among all U.S. states. More than half of Indiana's border is water, which includes 400 miles (640 km) of direct access to two major freight transportation arteries: the Great Lakes/St. Lawrence Seaway (via Lake Michigan) and the Inland Waterway System (via the Ohio River). The Ports of Indiana manages three major ports which include Burns Harbor, Jeffersonville, and Mount Vernon. In Evansville three public and several private port facilities receive year-round service from five major barge lines operating on the Ohio River. Evansville has been a U.S. Customs Port of Entry for more than 125 years. Because of this, it is possible to have international cargo shipped to Evansville in bond. The international cargo can then clear Customs in Evansville rather than a coastal port. The private Roman Catholic University of Notre Dame contains an endowment of $9.8 billion, the largest in Indiana. Indiana's 1816 constitution was the first in the country to implement a state-funded public school system. It also allotted one township for a public university. However, the plan turned out to be far too idealistic for a pioneer society, as tax money was not accessible for its organization. In the 1840s, Caleb Mills pressed the need for tax-supported schools, and in 1851 his advice was included in the new state constitution. Although the growth of the public school system was held up by legal entanglements, many public elementary schools were in use by 1870. Most children in Indiana attend public schools, but nearly 10% attend private schools and parochial schools. About one-half of all college students in Indiana are enrolled in state-supported four-year schools. The largest educational institution is Indiana University, the flagship campus of which was endorsed as Indiana Seminary in 1820. Indiana State University was established as the state's Normal School in 1865; Purdue University was chartered as a land-grant college in 1869. The three other independent state universities are Vincennes University (Founded in 1801 by the Indiana Territory), Ball State University (1918) and University of Southern Indiana (1965 as ISU - Evansville). Many of the private colleges and universities in Indiana are affiliated with religious groups. The University of Notre Dame and the University of Saint Francis are popular Roman Catholic schools. Universities affiliated with Protestant denominations include Anderson University, Butler University, Indiana Wesleyan University, Taylor University, Franklin College, Hanover College, DePauw University, Earlham College, Valparaiso University, University of Indianapolis, and University of Evansville. Indiana University Bloomington is the largest campus in the state, with an enrollment of over 42,000 students. The state's community college system, Ivy Tech Community College of Indiana, serves nearly 200,000 students annually, making it the state's largest public post-secondary educational institution and the nation's largest singly accredited statewide community college system. In 2008, the Indiana University system agreed to shift most of its associate (2-year) degrees to the Ivy Tech Community College System. The state has several universities ranked among the best in 2013 rankings of the U.S. News & World Report. The University of Notre Dame is ranked among the top 20, with Indiana University Bloomington and Purdue University ranking in the top 100. Butler, Valparaiso, and the University of Evansville are ranked among the top ten in the Regional University Midwest Rankings. Purdue's engineering programs are ranked eighth in the country. In addition, Taylor University is ranked first in the Regional College Midwest Rankings and Rose-Hulman Institute of Technology has been considered the top Undergraduate Engineering school (where a doctorate is not offered) for 15 consecutive years. Bankers Life Fieldhouse during an Indiana Pacers basketball game. As of 2013 Indiana has produced more National Basketball Association (NBA) players per capita than any other state. Muncie has produced the most per capita of any American city, with two other Indiana cities in the top ten. It has a rich basketball heritage that reaches back to the formative years of the sport itself. The Indiana Pacers of the NBA play their home games at Bankers Life Fieldhouse; they began play in 1967 in the American Basketball Association (ABA) and joined the NBA when the leagues merged in 1976. Although James Naismith developed basketball in Springfield, Massachusetts in 1891, Indiana is where high school basketball was born. In 1925, Naismith visited an Indiana basketball state finals game along with 15,000 screaming fans and later wrote "Basketball really had its origin in Indiana, which remains the center of the sport." The 1986 film Hoosiers is inspired by the story of the 1954 Indiana state champions Milan High School. Professional basketball player Larry Bird was born in West Baden Springs and was raised in French Lick. He went on to lead the Boston Celtics to the NBA championship in 1981, 1984, and 1986. Indianapolis is home to the Indianapolis Colts. The Colts are members of the South Division of the American Football Conference. The Colts have roots back to 1913 as the Dayton Triangles. They became an official team after moving to Baltimore, MD, in 1953. In 1984, the Colts relocated to Indianapolis, leading to an eventual rivalry with the Baltimore Ravens. After calling the RCA Dome home for 25 years, the Colts currently play their home games at Lucas Oil Stadium in Indianapolis. While in Baltimore, the Colts won the 1970 Super Bowl. In Indianapolis, the Colts won Super Bowl XLI, bringing the franchise total to two. In recent years the Colts have regularly competed in the NFL playoffs. Indiana has an extensive history with auto racing. Indianapolis hosts the Indianapolis 500 mile race over Memorial Day weekend at the Indianapolis Motor Speedway every May. The name of the race is usually shortened to "Indy 500" and also goes by the nickname "The Greatest Spectacle in Racing." The race attracts over 250,000 people every year making it the largest single day sporting event in the world. The track also hosts the Allstate 400 at the Brickyard (NASCAR) and the Red Bull Indianapolis Grand Prix (MotoGP). From 2000 to 2007, it hosted the United States Grand Prix (Formula One). Indiana features the world's largest and most prestigious drag race, the NHRA Mac Tools U.S. Nationals, held each Labor Day weekend at Lucas Oil Raceway at Indianapolis in Clermont, Indiana. Indiana is also host to two major unlimited hydroplane racing power boat race circuits in the major H1 Unlimited league: Thunder on the Ohio (Evansville, Indiana) and the Madison Regatta (Madison, Indiana). The following table shows the professional sports teams in Indiana. Teams in bold are in major professional leagues. Hinkle Fieldhouse, "Indiana's Basketball Cathedral," on the Butler University campus. Indiana has had great sports success at the collegiate level. In men's basketball, the Indiana Hoosiers have won five NCAA national championships and 21 Big Ten Conference championships. The Purdue Boilermakers were selected as the national champions in 1932 before the creation of the tournament, and have won 22 Big Ten championships. The Boilermakers along with the Notre Dame Fighting Irish have both won a national championship in women's basketball. In college football, the Notre Dame Fighting Irish have won 11 consensus national championships, as well as the Rose Bowl Game, Cotton Bowl Classic, Orange Bowl and Sugar Bowl. Meanwhile, the Purdue Boilermakers have won 10 Big Ten championships and have won the Rose Bowl and Peach Bowl. ^ "What to Call Elsewherians and why". CNN. November 7, 2007. http://www.cnn.com/2007/LIVING/wayoflife/11/07/mf.nicknames/. Retrieved October 4, 2008. ^ a b c "Table 1. Annual Estimates of the Resident Population for the United States, Regions, States, and Puerto Rico: April 1, 2010 to July 1, 2015" (CSV). U.S. Census Bureau. December 24, 2015. http://www.census.gov/popest/data/state/totals/2015/tables/NST-EST2015-01.csv. Retrieved December 24, 2015. ^ a b "Elevations and Distances in the United States". United States Geological Survey. 2001. http://pubs.usgs.gov/gip/Elevations-Distances/elvadist.html. Retrieved October 21, 2011. ^ William Vincent D'Antonio; Robert L. Beck. "Indiana – Settlement patterns and demographic trends". eb.com. http://www.britannica.com/EBchecked/topic/286017/Indiana/279873/Settlement-patterns-and-demographic-trends. Retrieved January 3, 2012. ^ "Gross Domestic Product by State". U. S. Bureau of Economic Analysis. http://www.bea.gov/iTable/iTableHtml.cfm?reqid=70&step=10&isuri=1&7007=2012&7036=-1&7003=200&7035=-1&7006=18000&7001=1200&7002=1&7090=70&7004=naics&7005=-1&7093=levels. Retrieved April 17, 2014. ^ A portion of the Northwest Territory's eastern section became the state of Ohio in 1803. The Michigan Territory was established in 1805 from part of the Indiana Territory's northern lands and four years later, in 1809, the Illinois counties were separated from the Indiana Territory to create the Illinois Territory. See John D. Barnhart; Dorothy L. Riker (1971). Indiana to 1816: The Colonial Period. The History of Indiana. I. Indianapolis: Indiana Historical Bureau and the Indiana Historical Society. pp. 311–13,337, 353, 355, and 432. ^ Stewart, George R. (1967) . Names on the Land: A Historical Account of Place-Naming in the United States (Sentry edition (3rd) ed.). Houghton Mifflin. p. 191. ^ Hodgin, Cyrus (1903). "The Naming of Indiana" (pdf transcriptionaccessdate=2014-1-16). Papers of the Wayne County, Indiana, Historical Society 1 (1): 3–11. ^ Haller, Steve (Fall 2008). "The Meanings of Hoosier: 175 Years and Counting". Traces of Indiana and Midwestern History 20 (4): 5 and 6. ISSN 1040-788X. Retrieved on January 23, 2014. ^ Graf, Jeffery. "The Word Hoosier". Indiana University – Bloomington. http://www.indiana.edu/~librcsd/internet/extra/hoosier.html. Retrieved February 27, 2012. ^ a b c d "Prehistoric Indians of Indiana". State of Indiana. http://in.gov/dnr/historic/files/prehisindians.pdf. Retrieved July 5, 2009. ^ a b "Northwest Ordinance of 1787". State of Indiana. http://www.in.gov/history/2695.htm#events. Retrieved July 24, 2009. ^ a b c d "Government at Crossroads: An Indiana chronology". The Herald Bulletin. January 5, 2008. http://www.heraldbulletin.com/news/local_news/government-at-crossroads-an-indiana-chronology/article_3a07aa44-1cd4-5028-82e7-96b907121b31.html?mode=jqm. Retrieved July 22, 2009. ^ a b "The History of Indiana". History. http://www.history.com/topics/us-states/indiana. Retrieved July 26, 2009. ^ Vanderstel, David G. "The 1851 Indiana Constitution by David G. Vanderstel". State of Indiana. http://www.in.gov/history/2689.htm. Retrieved July 24, 2009. ^ Funk, pp. 23–24, 163. ^ Gray 1995, p. 156. ^ Foote, Shelby (1974). The Civil War; a Narrative, Red River to Appomattox. Random House. pp. 343–344. ^ Gray 1995, p. 202. ^ Gray 1995, p. 13. ^ Branson, Ronald. "Paul V. McNutt". County History Preservation Society. http://www.countyhistory.com/doc.gov/037.htm. Retrieved July 26, 2009. ^ a b Pell, p. 31. ^ Gray 1995, p. 350. ^ Haynes, Kingsley E.; Machunda, Zachary B (1987). Economic Geography. pp. 319–333. ^ Gray 1995, p. 382. ^ "Indiana - Race and Hispanic Origin: 1800 to 1990". U.S. Census Bureau. http://www.census.gov/population/www/documentation/twps0056/twps0056.html. Retrieved December 28, 2012. ^ Gray 1995, pp. 391–392. ^ Indiana Historical Bureau. "History and Origins". Indiana Historical Bureau. http://www.in.gov/judiciary/supreme/2366.htm. Retrieved July 28, 2009. ^ Singleton, Christopher J.. "Auto industry jobs in the 1980s: a decade of transition". United States Bureau of Labor Statistics. http://www.bls.gov/opub/mlr/1992/02/art2full.pdf. Retrieved July 28, 2009. ^ a b c "Profile of the People and Land of the United States". National Atlas of the United States. http://www.nationalatlas.gov/articles/mapping/a_general.html. Retrieved August 17, 2012. ^ a b c "The Geography of Indiana". Netstate. http://www.netstate.com/states/geography/in_geography.htm. Retrieved August 13, 2012. ^ "NOAA's Great Lakes Region". National Oceanic and Atmospheric Administration. April 25, 2007. http://www.regions.noaa.gov/great-lakes/. Retrieved September 29, 2009. ^ a b c d e "Indiana". Funk & Wagnalls New World Encyclopedia. Funk & Wagnalls. ^ Meredith, Robyn (March 7, 1997). "Big-Shouldered River Swamps Indiana Town". The New York Times. http://www.nytimes.com/1997/03/07/us/big-shouldered-river-swamps-indiana-town.html. Retrieved August 19, 2009. ^ Logan, William N.Expression error: Unrecognised word "etal". (1922). Handbook of Indiana Geology. Indiana Department of Concervation/. p. 257. ^ "Information Bulletin #4 (Second Amendment), Outstanding Rivers List for Indiana". Natural Resources Commission. May 30, 2007. http://www.in.gov/legislative/register/20070530-IR-312070287NRA.xml.pdf. Retrieved August 15, 2012. ^ Boyce, Brian M (August 29, 2009). "Terre Haute's Top 40: From a trickle in Ohio to the Valley's signature waterway, the Wabash River is forever a part of Terre Haute". Tribune-Star. http://www.tribstar.com/local/x46868269/Terre-Hautes-Top-40-From-a-trickle-in-Ohio-to-the-Valley-s-signature-waterway-the-Wabash-River-is-forever-a-part-of-Terre-Haute. Retrieved September 24, 2009. ^ Jerse, Dorothy (March 4, 2006). "Looking Back: Gov. Bayh signs bill making Wabash the official state river in 1996". Tribune-Star. http://www.tribstar.com/history/x681765834/Looking-Back-Gov-Bayh-signs-bill-making-Wabash-the-official-state-river-in-1996. Retrieved September 7, 2009. ^ Ozick, Cynthia (November 9, 1986). "Miracle on Grub street; Stockholm". The New York Times. ^ Fantel, Hans (October 14, 1984). "Sound; CDs make their mark on the Wabash Valley". The New York Times. ^ "INDIANA LAKES LISTING". http://www.in.gov/dnr/fishwild/files/Indiana_Lakes_Listing_By_County_March_2007.pdf. Retrieved January 26, 2015. ^ Leider, Polly (January 26, 2006). "A Town With Backbone: Warsaw, Ind.". CBS News. http://www.cbsnews.com/news/a-town-with-backbone-warsaw-ind/. Retrieved September 29, 2009. ^ Bridges, David (November 28, 2007). "Life in Indiana — Telegraph Mentor". The Daily Telegraph (London). http://www.telegraph.co.uk/expat/mentorsforexpats/4211551/Life-in-Indiana---Telegraph-Mentor.html. Retrieved July 4, 2009. ^ a b "NWS Climate Data". NWS. http://www.weather.gov/climate/. Retrieved December 23, 2010. ^ "Indiana — Climate". City-Data.com. http://www.city-data.com/states/Indiana-Climate.html. Retrieved July 4, 2009. ^ Engineering Analysis Inc. (April 12, 2012). "Mississippi Remains #1 Among Top Twenty Tornado-Prone States". mindspring.com. http://eai.home.mindspring.com/EAIprs94.html. Retrieved August 13, 2012. ^ Engineering Analysis Inc. (October 28, 2011). "Six States Contain Twelve of the Top Twenty Tornado-Prone Cities (revised version)". mindspring.com. http://www.mindspring.com/~eai/EAIprs01.html. Retrieved August 13, 2012. ^ Kellogg, Becky (March 8, 2011). "Tornado Expert Ranks Top Tornado Cities". The Weather Channel. http://www.weather.com/outlook/weather-news/severe-weather/articles/top-tornado-cities_2011-03-08?page=2. Retrieved August 13, 2012. ^ In an earlier 2008 report, Indiana was listed as one of the most tornado-prone states in the United States, ranking sixth, while South Bend was ranked the 14th most tornado-prone city in the country, ahead of cities such as Houston, Texas, and Wichita, Kansas. See Mecklenburg, Rick (May 1, 2008). "Is Indiana the new Tornado Alley?". SouthBendTribune.com. http://articles.southbendtribune.com/2008-05-01/news/26911876_1_tornado-track-damaging-winds-and-tornadoes-indiana. Retrieved August 13, 2012. ^ In a published list of the most tornado-prone states and cities in April 2008, Indiana came in first and South Bend ranked 16th. See Henderson, Mark (May 2, 2008). "Top 20 Tornado Prone Cities and States Announced". WIFR. http://www.wifr.com/weather/headlines/17036536.html. Retrieved August 17, 2009. ^ Henderson, Mark (May 2, 2008). "Top 20 Tornado Prone Cities and States Announced". WIFR. http://www.wifr.com/weather/headlines/17036536.html. Retrieved August 17, 2009. ^ "Climate Facts". Indiana State Climate Office. http://www.agry.purdue.edu/climate/facts.aspgif. Retrieved May 29, 2009. ^ "Indiana climate averages". Weatherbase. http://www.weatherbase.com/weather/city.php3?c=US&s=IN&statename=Indiana-United-States-of-America. Retrieved November 12, 2015. ^ a b c d e "Guide to 2010 Census State and Local Geography - Indiana". U.S. Census Bureau. April 21, 2014. http://www.census.gov/geo/reference/guidestloc/st18_in.html. Retrieved August 13, 2012. ^ A 2008 news report indicated there were 13 metropolitan areas in Indiana. See Dresang, Joel (July 30, 2008). "Automaking down, unemployment up". Milwaukee Journal Sentinel. http://www.jsonline.com/blogs/business/52021282.html. Retrieved August 14, 2009. ^ Indiana's territorial capitals were Vincennes and later Corydon, which also became Indiana's first state capital when it became a state. ^ "Indiana". Indiana Business Research Center, Indiana University, Kelley School of Business. http://www.stats.indiana.edu/profiles/profiles.asp?scope_choice=a&county_changer=18000&button1=Get+Profile&id=2&page_path=Area+Profiles&path_id=11&panel_number=1. Retrieved August 14, 2012. ^ "American FactFinder". census.gov. http://factfinder2.census.gov/main.html. Retrieved March 5, 2016. ^ Resident Population Data. "Resident Population Data – 2010 Census". United States Census Bureau. http://www.census.gov/2010census/data/apportionment-pop-text.php. Retrieved December 23, 2012. ^ "2010 Census Centers of Population by state". U.S. Census Bureau. http://www.census.gov/geo/www/2010census/centerpop2010/CenPop2010_Mean_ST.txt. Retrieved August 15, 2012. ^ Over the previous decade, Indiana's population center has shifted slightly to the northwest. In the 2000 U.S. Census, Indiana's center of population was located in Hamilton County, in the town of Sheridan. See "Population and Population Centers by State". United States Census Bureau. http://www.census.gov/geo/www/cenpop/statecenters.txt. Retrieved November 21, 2006. ^ "Metro and Nonmetro Counties in Indiana". Rural Policy Research Institute. http://www.rupri.org/Forms/Indiana.pdf. Retrieved October 10, 2009. ^ a b c "Indiana QuickFacts from the US Census Bureau". United States Census Bureau. http://quickfacts.census.gov/qfd/states/18000.html. Retrieved August 13, 2012. ^ Greninger, Howard (May 19, 2007). "Vigo County's population on the rise". Tribune-Star. http://www.tribstar.com/local/local_story_139235811.html. Retrieved October 10, 2009. ^ "2010 Census Data". census.gov. http://www.census.gov/2010census/data/. Retrieved February 24, 2015. ^ "Profile of General Population and Housing Characteristics: 2010; 2010 Demographic Profile Data (DP-1) for Indiana". United States Census Bureau. http://quickfacts.census.gov/qfd/states/18000.html. Retrieved August 13, 2012. ^ "DP-2. Profile of Selected Social Characteristics: 2000". United States Census Bureau. http://factfinder.census.gov/servlet/QTTable?_bm=y&-geo_id=04000US18&-qr_name=DEC_2000_SF3_U_DP2&-ds_name=DEC_2000_SF3_U&-redoLog=false. Retrieved October 17, 2009. ^ Pulera, Dominic J. (2004). Sharing the Dream: White Males in a Multicultural America. New York: Continuum. p. 57. ISBN 0-8264-1643-8. https://books.google.com/books?id=SVoAXh-dNuYC&pg=PA57. ^ Farley, Reynolds (1991). "The New Census Question about Ancestry: What Did It Tell Us?". Demography 28 (3): 411–429. DOI:10.2307/2061465. PMID 1936376. ^ Lieberson, Stanley (1985). "The Use of Nativity Data to Estimate Ethnic Characteristics and Patterns". Social Science Research 14 (1): 31–56 [pp. 44–46]. DOI:10.1016/0049-089X(85)90011-0. ^ Lieberson, Stanley (1986). "Ethnic Groups in Flux: The Changing Ethnic Responses of American Whites". Annals of the American Academy of Political and Social Science 487 (79): 79–91 [pp. 82–86]. DOI:10.1177/0002716286487001004. ^ "Ancestry of the Population by State: 1980 – Table 3" (PDF). http://www.census.gov/population/www/censusdata/files/pc80-s1-10/tab03.pdf. Retrieved December 10, 2011. ^ Rainey, Joan P (2000). "Hamilton and Other Suburban Counties Lead the State in Population Growth". Indiana University. http://www.ibrc.indiana.edu/ibr/2000/summer00/01.pdf. Retrieved October 17, 2009. ^ "IU Kelley School: Indiana's largest cities continue to see strong population growth" (in en-US). http://news.iu.edu/releases/iu/2015/05/indiana-city-populations-2014.shtml. Retrieved 2016-01-09. ^ a b Nevers, Kevin (July 11, 2008). "Duneland population growth rate slows a bit in 2007 Census estimates". Chesterton Tribune. http://chestertontribune.com/Duneland%20Community%20News/7112%20duneland_population_growth_rate.htm. Retrieved August 5, 2009. ^ "Indiana sees big gains in population among certain cities and towns" (Press release). Indiana University. July 10, 2008. http://newsinfo.iu.edu/news/page/normal/8512.html. Retrieved August 15, 2009. ^ "Annual Estimates of the Population of Metropolitan and Micropolitan Statistical Areas". United States Census. Archived from the original on July 9, 2010. http://webarchive.loc.gov/all/20100709020951/http%3A//www%2Ecensus%2Egov/popest/metro/tables/2007/CBSA%2DEST2007%2D01%2Ecsv. Retrieved August 14, 2009. ^ "Overview for Indiana". Indiana Business Research Center, Indiana University Kelley School of Business. August 1, 2012. http://www.stats.indiana.edu/uspr/a/us_profile_frame.html. Retrieved August 14, 2012. ^ a b Justis, Rachel M (2006). "Household Income Varies by Region and Race". Indiana University. http://www.ibrc.indiana.edu/ibr/2006/fall/article2.html. Retrieved October 29, 2009. ^ "Religious Affiliation by State in the Midwest". Pew Forum (PDF). p. 100. http://religions.pewforum.org/pdf/report-religious-landscape-study-full.pdf. Retrieved March 5, 2015. ^ "The Association of Religion Data Archives | State Membership Report". www.thearda.com. http://www.thearda.com/rcms2010/r/s/18/rcms2010_18_state_adh_2010.asp. Retrieved November 12, 2013. ^ "American Religious Identification Survey". City University of New York. Archived from the original on December 19, 2006. https://web.archive.org/20061219030815/http://www.gc.cuny.edu:80/faculty/research_briefs/aris/key_findings.htm. Retrieved December 25, 2006. ^ Bodenhamer, Barrows and Vanderstel, p. 416. ^ Neff, David (March 27, 2006). "Holiness Without the Legalism". Christianity Today. http://www.christianitytoday.com/ct/2006/marchweb-only/113-12.0.html. Retrieved August 15, 2009. ^ "Quakers of Richmond and Wayne County, Indiana". Earlham College. http://www.earlham.edu/Q/brochure1/#did_you_know. Retrieved August 15, 2009. ^ Wilson, Amy Lyles. "The Guts to Keep Going". National Public Radio. http://www.npr.org/templates/story/story.php?storyId=7780491. Retrieved August 15, 2009. ^ Associated Press (February 2, 2009). "Are American Muslims 'under more scrutiny' with Obama?". USA Today. http://www.usatoday.com/news/religion/2009-02-02-muslims-obama_N.htm. Retrieved August 15, 2009. ^ a b c d e f g h "Indiana Facts". State of Indiana. http://www.state.in.us/portal/files/WebPageFactsBooklet.pdf. Retrieved August 3, 2009. ^ Indiana State Chamber of Commerce (2007), p. 10. ^ "Indiana Constitution Article 5". Indiana University. February 25, 1999. http://www.law.indiana.edu/uslawdocs/inconst/art-5.html. Retrieved August 3, 2009. ^ Indiana State Chamber of Commerce (2007), p. 13. ^ a b c "Indiana Constitution Article 4". Indiana University. February 25, 1999. http://www.law.indiana.edu/uslawdocs/inconst/art-4.html. Retrieved August 3, 2009. ^ Indiana State Chamber of Commerce (2005), p. 14. ^ "Indiana Constitution Article 7". Indiana University. February 25, 1999. http://www.law.indiana.edu/uslawdocs/inconst/art-7.html. Retrieved August 3, 2009. ^ "Appellate Process". State of Indiana. February 4, 2009. Archived from the original on July 23, 2009. https://web.archive.org/20090723101408/http://www.in.gov/judiciary/supreme/appellate.html. Retrieved August 3, 2009. ^ "Indiana Trial Courts: Types of Courts". State of Indiana. http://www.in.gov/judiciary/2674.htm. Retrieved May 4, 2014. ^ Gray 1977, p. 23. ^ Gray 1977, p. 82. ^ Gray 1977, p. 118. ^ Gray 1977, p. 162. ^ "Indiana poll shows tight race with McCain, Obama". Associated Press. Fox News Channel. October 1, 2008. http://www.foxnews.com/wires/2008Oct01/0,4670,Poll2008Indiana,00.html. Retrieved August 10, 2009. ^ Purnick, Joyce (October 21, 2006). "The 2006 Campaign: Struggle for the House; In a G.O.P. Stronghold, 3 Districts in Indiana Are Now Battlegrounds". The New York Times. http://query.nytimes.com/gst/fullpage.html?res=9D0CEFDA163FF932A15753C1A9609C8B63. Retrieved August 10, 2009. ^ a b c "Presidential General Election Map Comparison". uselectionatlas.org. http://uselectionatlas.org/RESULTS/comparemaps.php?year=2008&fips=18&f=1&off=0&elect=0. Retrieved August 11, 2009. ^ McPhee, Laura (November 12, 2008). "Indiana's historic vote for Obama". NUVO. http://www.nuvo.net/indianapolis/indianas-historic-vote-for-obama/Content?oid=1263801#.U2Y6DPldVv0. Retrieved August 10, 2009. ^ "Election Results: Indiana General Election, November 6, 2012". State of Indiana. http://www.in.gov/apps/sos/election/general/general2012?page=office&countyID=-1&officeID=36&districtID=-1&candidate=. Retrieved April 21, 2014. ^ Modie, Neil (August 12, 2005). "Where have Seattle's lefties gone?". Seattle Post-Intelligencer. http://www.seattlepi.com/local/236320_liberal12.html. Retrieved August 11, 2009. ^ Fortune 500 companies - Indiana.Fortune 500. Retrieved on October 15, 2014. ^ "Economic Base". City of Valparaiso. http://ci.valparaiso.in.us/documentcenter/view/281. Retrieved November 2, 2009. ^ "GDP by State". Greyhill Advisors. http://greyhill.com/gdp-by-state. Retrieved September 7, 2011. ^ "Indiana Economy at a Glance". U.S. Bureau of Labor Statistics. http://stats.bls.gov/eag/eag.in.htm. Retrieved January 11, 2007. ^ (July 19, 1998) "Manufacturers in Indiana". ^ "Economy & Demographics". Terre Haute Economic Development Co.. http://www.terrehauteareaedc.com/econ_industry.htm. Retrieved January 30, 2007. ^ "USDA Crop Profiles". United States Department of Agriculture. Archived from the original on February 23, 2007. https://web.archive.org/web/20070223130933/http://cipm.ncsu.edu/cropprofiles/cplist.cfm?org=state. Retrieved November 20, 2006. ^ "Best/Worst States for Business | ChiefExecutive.net | Chief Executive Magazine". ChiefExecutive.net. May 3, 2011. http://chiefexecutive.net/best-worst-states-for-business. Retrieved December 10, 2011. ^ "State Sales Tax Rates". Money-Zine.com. http://www.money-zine.com/Financial-Planning/Tax-Shelter/State-Sales-Tax-Rates/. Retrieved January 26, 2012. ^ "INDIANA Retail Sales Tax & Use Tax". Indiana Department of Revenue. State of Indiana. http://www.in.gov/dor/files/brochure3.pdf. Retrieved January 26, 2012. ^ "Many states celebrate surpluses as Congress struggles with debt". Washington Times. July 17, 2011. http://www.washingtontimes.com/news/2011/jul/17/many-states-celebrate-surpluses-as-congress-strugg/. Retrieved December 10, 2011. ^ Indiana Geological Survey. "Coal in Indiana". Purdue University. http://igs.indiana.edu/coal/index.cfm. Retrieved October 19, 2010. ^ "WINDExchange: U.S. Installed Wind Capacity". windpoweringamerica.gov. http://www.windpoweringamerica.gov/wind_installed_capacity.asp. Retrieved February 24, 2015. ^ "New Indianapolis Airport". Indianapolis Airport Authority. http://www.indianapolisairport.com. Retrieved January 6, 2007. ^ "Gary Airpport Gets Millions in Federal Funding". CBS Channel 2. Archived from the original on February 18, 2006. https://web.archive.org/20060218014515/http://cbs2chicago.com:80/topstories/local_story_016180843.html. Retrieved October 18, 2006. ^ "Indiana Rail Plan". Indiana Department of Transportation. http://www.in.gov/indot/3065.htm. ^ "Ports of Indiana Website". http://www.portsofindiana.com. Retrieved January 7, 2007. ^ "Indiana History: Indiana, the Nineteenth State (1816)". Center for History. http://centerforhistory.org/learn-history/indiana-history/indiana-the-nineteenth-state-1816. Retrieved August 26, 2009. ^ "About UE". University of Evansville. Archived from the original on January 6, 2010. https://web.archive.org/20100106123440/http://www.evansville.edu:80/aboutue/. ^ "Ivy Tech Reports Record Enrollment". http://www.insideindianabusiness.com/newsitem.asp?id=49433. Retrieved July 23, 2014. ^ "Hoosier State Gets Coordinated". Inside Higher Ed. May 16, 2008. http://www.insidehighered.com/news/2008/05/16/indiana. Retrieved March 21, 2014. ^ Fischer-Baum, Reuben (June 17, 2013). "Infographics: Where Do Pro Basketball Players Come From?". Deadspin. http://deadspin.com/infographics-where-do-pro-basketball-players-come-from-513261549. Retrieved June 18, 2013. ^ "Larry Bird Biography - Facts, Birthday, Life Story - Biography.com". http://www.biography.com/people/larry-bird-9213087. Bodenhamer, David J.; Barrows, Robert Graham; Vanderstel, David Gordon (1994). The Encyclopedia of Indianapolis. Indiana University Press. ISBN 0-253-31222-1. Brill, Marlene Targ (2005). Indiana. Marshall Cavendish. ISBN 0-7614-2020-7. Carmony, Donald F. (1998). Indiana, 1816 to 1850: The Pioneer Era. Indianapolis: Indiana Historical Society. ISBN 0-87195-124-X. Funk, Arville L (1967). Hoosiers In The Civil War. Adams Press. ISBN 0-9623292-5-8. Gray, Ralph D (1977). Gentlemen from Indiana: National Party Candidates,1836–1940. Indiana Historical Bureau. ISBN 1-885323-29-8. Gray, Ralph D (1995). Indiana History: A Book of Readings. Indiana University Press. ISBN 0-253-32629-X. Indiana State Chamber of Commerce (2005). Here is Your Indiana Government. Indiana State Chamber of Commerce (2007). Here is Your Indiana Government. Indiana Writer's Project (1973) . Indiana: A Guide To The Hoosier State. American Guide Series. Jackson, Marion T., ed. (1997). The Natural Heritage of Indiana. Bloomington: Indiana University Press. ISBN 0-253-33074-2. Logan, William Newton; Cumings, Edgar Roscoe; Malott, Clyde Arnett; Visher, Stephen Sargent; Tucker, William Motier; Reeves, John Robert (1922). Handbook of Indiana Geology. William B. Burford. Madison, James H. Hoosiers: A New History of Indiana. Bloomington, IN: Indiana University Press, 2014. Madison, James H. (1990). The Indiana Way: A State History. Bloomington and Indianapolis: Indiana University Press and Indiana Historical Society. ISBN 0-253-20609-X. Moore, Edward E (1910). A Century of Indiana. American Book Company. Pell, Ed (2003). Indiana. Capstone Press. ISBN 0-7368-1582-1. Skertic, Mark; John J. Watkins (2003). A Native's Guide to Northwest Indiana. Taylor, Robert M., ed. (1990). Indiana: A New Historical Guide. Indianapolis: Indiana Historical Society. ISBN 0-87195-048-0. Taylor, Robert M., ed. (2001). The State of Indiana History 2000: Papers Presented at the Indiana Historical Society's Grand Opening. Indianapolis: Indiana Historical Society. This page uses content from the English language Wikipedia. The original content was at Indiana. The list of authors can be seen in the page history. As with this Familypedia wiki, the content of Wikipedia is available under the Creative Commons License.